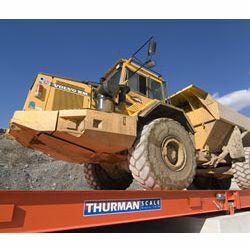 Thurman Diamondback XD Extreme-Duty, Electronic Steel Deck, Truck Scales The Diamondback XD Steel Deck Truck Scales are built extra-tough to handle the monster truck loads typical of extreme weighing applications. This NTEP-rated scale's 130,000 lb Concentrated Load Capacity (CLC) guarantees that its weighbridge can take a pounding and consistently deliver accurate weighments. Item Number Deck Size Nominal Cap. Modules/Section Shipping Wt.